New Delhi, India (April 18, 2013): It is a known fact that Prof. Devender Pal Singh Bhullar was sentenced to death by the trial court solely on the basis of a fractured and uncorroborated confessional statement extracted by the Delhi police in custody through torture. Prof. Bhullar’s case was heard by three judges bench of the Supreme Court of India, that confirmed the conviction in a split decision – with majority of 2:1. Justice M. B. Shah – the presiding judge of the three judges bench had acquitted Prof. Devender Pal Singh Bhullar; while two other judges Arijit Pasyat, J. and Aggarwal, J. had confirmed the death sentence. The 2002 decision of the Supreme Court of India, confirming death punishment in a split decision was being view as a “judicial error” – and it was expected that the President of India would take it’s notice while deciding the constitutional review petition. 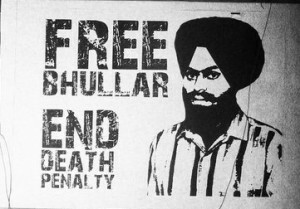 The President of India took eight years to decide the petition moved on behalf of Prof. Bhullar but suffered the failure to take notice of the judicial error and cleared the execution of Prof. Bhullar in 2011. 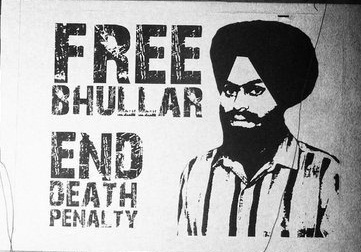 In it’s recent judgement declared on April 12, 2013 the Supreme Court of India has again upheld the death sentence awarded to Prof. Bhullar. It seems as if whole Indian system has turned blind eye towards the “judicial error” committed in this case. But there are few dissenting voices also that have dared to oppose the ominous unity among various organs of the state favouring execution of Prof. Bhullar. Recently, the Press Council of India’s chairman Justice Markandey Katju wrote a detailed letter to the President of India. Citing the basic flaws in the decision confirming death sentence in Prof. Bhullar’s case; J. Katju has demanded pardon for Prof. Bhullar. As per recent media reports Senior Advocate Anoop G. Chaudhari, who was the public prosecutor against Prof. Bhullar while his case was being heard by the SCI in 2002, has admitted that the minority judgement of Justice M. B. Shah acquitting Prof. Bhulalr was good in merit. “[t]hough two of the three judges on the Supreme Court bench upheld his arguments, senior advocate Anoop G. Chaudhari said that he found himself agreeing with the dissenting verdict delivered by the presiding judge, M. B. Shah, who had actually acquitted Bhullar”. “Surprising as it may sound, I believe that Shah was right in not accepting my submissions in support of the trial court’s decision to convict Bhullar in a terror case, entirely on the basis of his confessional statement to the police,” Chaudhari reportedly told TOI. As per news report, a former advocate general of Madhya Pradesh, Chaudhari also said that it was “most inappropriate” for the majority verdict, delivered by Justice Arijit Pasayat, to have awarded death sentence to Bhullar despite the acquittal by a member of the same bench. In any event, this “judicial error”, he said, should have been taken by the home ministry as a “strong ground” for commuting the death penalty, when it made its recommendation to the President on Bhullar’s mercy petition in 2011. “Did the home ministry think that the acquittal by a Supreme Court judge was meaningless?” Chaudhari asked. But how could he be saying all these things in Bhullar’s favour, given his own role in the case? “After the judgement is delivered, I read it as a student of law and not a lawyer who appeared for one or the other party,” Chaudhari said. “If I can’t detach myself from the case and appreciate the judgement in its correct perspective, then I won’t be honest to my profession and my conscience”, he reportedly added. One of the major infirmities in the prosecution’s case pointed out by Shah was the failure of the police to find any corroboration for Bhullar’s confessional statement to them, even he had retracted it. “When Shah asked me about this lacuna during the hearings, I said that I could only argue what was on record and I could not step into the shoes of the investigating agency and explain why they had not taken the trouble of finding any corroborative evidence” Chaudhari said.